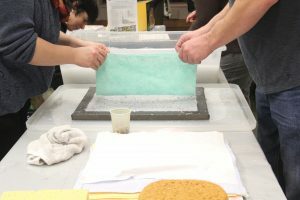 Paper-making workshops were the first phase of For All is For Yourself, in both Richmond and Kelowna. Part of the exhibition is a collection of 10,000 laser-cut bumblebees made of paper that were created by members of the community. 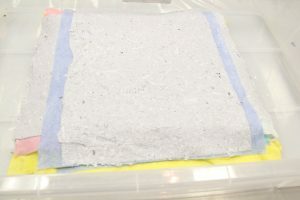 Kelowna’s paper was embedded with Gaillardia seed; Richmond’s paper was embedded with golden alyssum, each flower being appropriate to each region. 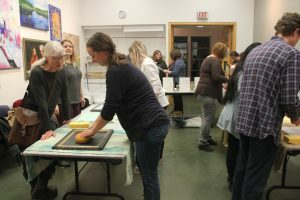 From January to April 2016, Kelowna’s Public Art Pollinator Pasture Team created 300 sheets of seed-embedded paper with members of the community. We worked with wonderful groups from the Okanagan Master Gardeners, the Clubhouse Child Care Centre, Kelowna Homelearner’s Group, Lake Country Gardener’s Club, Mount Boucherie Secondary School, the Beta Sigma Phi Sorority, the Good Samaritan Society at Mountainview Village and The Kelowna Art Gallery. Special thanks to volunteer Leanne Stringer! The paper was sent to the ChART Collective which laser cut the paper into 5,000 paper bees. These bees will join 5,000 Richmond bees for the exhibition in Kelowna.